T-Mobile has put the brakes on their popular North America voice and data plan, which offered American customers unlimited LTE roaming in Canada and Mexico. Starting November 12, 2017 customers on T-Mobile ONE, Simple Choice North America, or legacy rate plans with a qualifying feature will receive unlimited talk, text and data with a maximum of 5GB of 4G LTE. 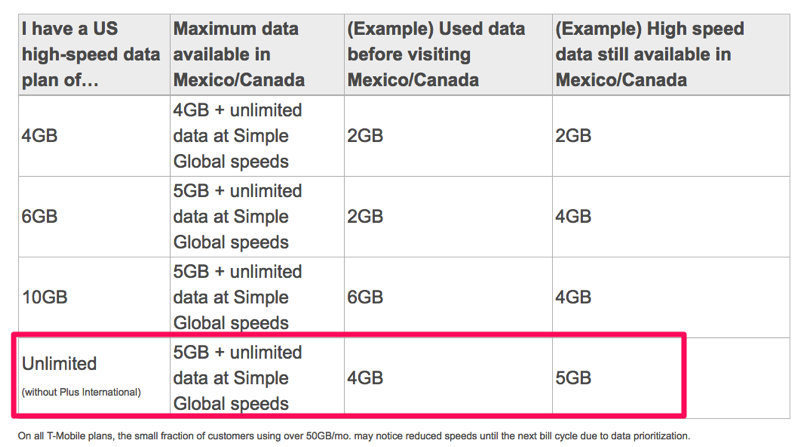 After 5GB of high-speed data is used in Mexico and Canada (or your high-speed data allotment is reached, whichever comes first), customers will stay connected with unlimited data at Simple Global speeds (up to 128kbps for most plans or 256kbps with T-Mobile ONE Plus). A spotlight on how Canadians were using T-Mobile cellular plans was highlighted earlier this year by Vice Money, which showed how for $50 USD, one could get a plan with unlimited data, text and calls in Canada, the U.S. and Mexico. Many probably saw this coming, as customers roaming on LTE in Canada would mean T-Mobile paying its roaming partners here, and for a small number of users exploiting the plan, the free ride looks to have come to an end.